Tennant made his professional acting debut at the tender age of 16, appearing in an anti-smoking film made by the Glasgow Health Board which aired on television and was also screened in schools. A year later, Tennant could be seen in an episode of the children's anthology series Dramarama. Tennant's earliest feature film role was in Jude (1996), in which he shared a scene with fellow Doctor to be, Christopher Eccleston. Tennant developed his career in the British theatre, frequently performing with the Royal Shakespeare Company. His first Shakespearean role for the RSC was in As You Like It (1996). He subsequently specialized in comic roles, playing Antipholus of Syracuse in The Comedy of Errors and Captain Jack Absolute in The Rivals, although he also played the tragic role of Romeo in Romeo and Juliet. 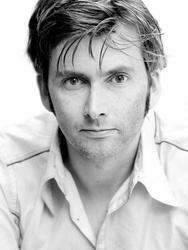 2005 saw David Tennant live out a childhood dream by being cast as the indomitable Doctor Who. Tennant's run as the Tenth Doctor won massive praise from fans and critics alike, with the readers of Doctor Who magazine voting him "Best Doctor." Tennant's run as the Doctor lasted five years and made an indelible impact on the series and its appeal not only among longtime fans but converts as well. His final appearance as the Tenth Doctor was for the 50th anniversary special The Day of the Doctor was a landmark event in the series' history that brought together the series' past, present and future. Tennant was next seen on the hugely successful BBC detective series Broadchurch. International interest in the show was such that a US remake was commissioned with Tennant cast once again as the lead. Re-titled Gracepoint, the series was filmed between January and May 2014 and aired in October of 2014 on Fox. Tennant can next be seen as the villainous Kilgrave in the Marvel Studios project, Jessica Jones, to be seen on Netflix.